I am very much addicted to makeup brushes... I love them! I love trying different brands, shapes, types, etc... But one thing that makes this obsession not look so bad is, that I use every single one of them all the time! Sometimes I don't have any more time left to wash used brushes after work and the next day I have to be on set early again, so I always have a clean set handy. I have a separate brush set for my personal use and I never mix them up. But usually I am updating my professional brush kit. So this time I added Sigma Essential Kit with a brush cup holder, F86 - Tapered Kabuki and a F35 Tapered Highlighter brushes. I already washed them few times and used them on different makeup jobs, and I am happy with the quality. The brush holder is very handy, especially on ocassions, when I don't have much space. I have to say that this brush set is enough to do a complete makeup look. Last weekend the United Makeup Artist Expo took place in Business Design Centre in Islington, London (http://www.umae.co.uk/). Of course I couldn’t miss the opportunity of visiting the place full of different makeup professionals, seminars, brands and of course discounts! I came home with a full bag of goodies and now cannot wait to try them out! As the weather is warmer and warmer the need to look prettier gets bigger and bigger... I'm now tanned quite a bit in comparison with how pale my skin looks in the winter time, so I needed a new, darker foundation, suitable for hot weather. I've herd that Make Up For Ever Mat Velvet+ foundation works wonders for combination to oily skin, so I picked up this in number 45. It is still slightly dark for me, but I will get to that shade! I like the formulation, how it applies and how it looks like. This even might become my most loved foundation! With my new face make up routine follows new concealer from Inglot. It is called Corrective Illuminator and the shade is 55 (I think because it's the only number or name I was able to find). It does brighten up my under eye are, and because ot it's yellow tone it counteracts darkness, but it's so light that I doubt if it would cower really bad under eye circles. And I don't like how you can't see how much product you have left in that black packaging. And brushes. I love brushes. Inglot 10S is a tapered brush with long bristles, that are not fluffy as the most blending brushes are, so it works for precised work in the eye crease. It's not a must have, but an interesting addition. Also I picked up Inglot 22T concealer brush only because I needed one and well.. it does it's job. What else could you expect from the concealer brush, right? Yeah, I know how I have written about cannot find MAC brushes in my country, but after trying them out I intensified MAC products search and discovered a little beauty salon, that has a tiny amount of MAC stuff. Like so tiny that they had only four different brushes, so I grabbed MAC 217 and I'm wowed how it does everything for my eye look. This by itself could be enough for the whole eye make up! 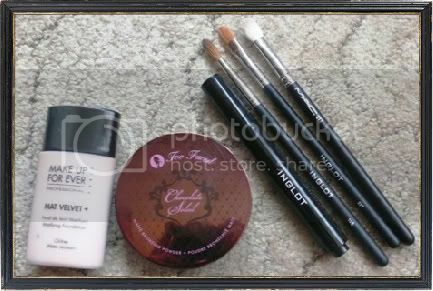 First item is called Velvet Touch eye primer. It is so new that I could not even find it in their website. I think it is made to even out lines under the eyes, because it has that silicon feel to it, but I could be wrong. Hope to get more information about that. About High Gloss Lipstick I have talked earlier. This color is quite dark and strong. It looks best when I'm only wearing some foundation and maybe mascara. With more make up it would be too much. 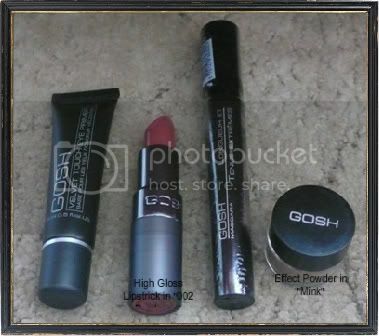 I have heard that these High Gloss lipsticks are made exceptionally for few European countries. This could be the same with the eye primer. Amazing Lengen' Build mascara in Black is still not opened, because I have to finish few others, so I can not tell much about it, but I have hight expectations with this. 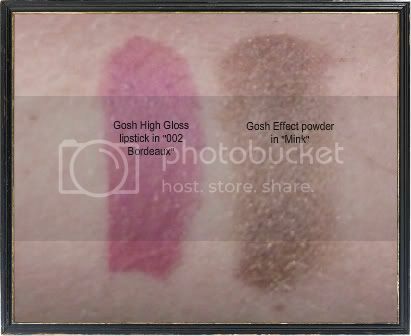 And the last Gosh product is Effect Powder, which is basically a pigment. The color does not look that flattering on the screen but it's nice for neutral bronzed looks, because it has golden flecks in it. 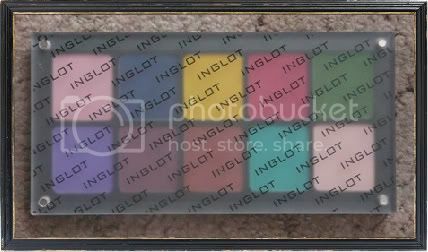 I could not resist getting another Inglot eye shadow palette.. 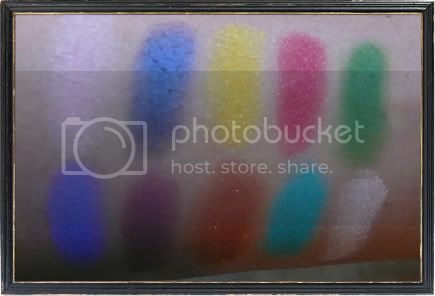 The feeling of picking up colors glamors me. This time much more colorful view outside (green trees in bloom, colorful flowers, fresh grass) made me want bright colors. 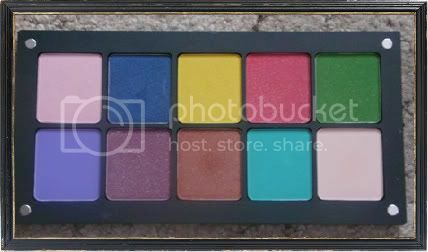 I'm planning on getting neutral colors palette someday, because I like these Inglot eye shadow palettes a lot. And finally, I got some fragrances perfect for heating weather. Puma "Aqua" eau de toilette is a sweet fruity, but not too strong scent. It includes of apple, strawberry, lime, white peach, water hyacinth, patchouli and sandalwood. This thought does stay on me for only few hours at most. DKNY eau de parfum "Be delicious" is light and fresh scented. It combines the scent of apple with a blend of exotic flowers and sensual woods. I definitely can smell a green apple just picked off a tree and a little bit of a cucumber in this and I love it. And the scent stays all day long! And with this I got gift with purchase travel sized kit with the same smelling shower gel, body lotion and perfume spray. Good deal, right? Since we don't have any MAC stores and their site does not ship here either (what makes me wanna cry), I am not able to buy them directly. Of course there is always an option to get those on e-bay but I'm too afraid to get a fake, or there is an opportunity that I will get a product and will not know if it's fake or not (because I can not compare it with original) so this would probably drive me crazy. The only way to get MAC stuff is wait till someone (well ok, or myself) will go to other country and buy them for me. And finally my plan and hopes succeeded! As I had to pick up only few items this had to be brushes :) My mini list of four brushes became only two because they didn't have full stock. I'm very glad to represent two MAC brushes that came from Turkey, Istanbul, which I LOOOOVE! Oh my gosh this is perfect for everything! I've tried it with foundation, blush, contouring, highlighting... Perfect job! As I'm too afraid it will start shedding too much (and there are lots of reviews, that says it does tend to) so my decision to use this brush for contouring. And it works wonders! I was in a hunt of a good quality pencil brush for ever. And all I have tried before this, did not work as I would like it to do. The brushes were too long, too short, it was too fluffy... But this is it! It is a bit pokey but it is the reason why it works so brilliantly! I use this for smudging eyeliner, putting color under my lower lash line or even for precision work on the outer corner! Thank you JZ, that you did such a favor for me!